This version has no title screen; it just launches you right into it. Zerg is a minor, inconsequential freeware RPG, destined for a bottom-10% GIMLET score, and yet it must be said that it offered exactly what I needed at exactly the moment that I needed it. After a number of frustrating hours with The Seventh Link and Theldrow, I desperately needed something I could finish and write about in just a few hours. Zerg appeared like a New Year’s miracle. Some Ultima-esque dialogue as I enter the castle. The king offers the first quest. If you say “no,” he says, “away with thee!” and you can’t do anything else to progress. The kingdom consists of a single island roughly in the shape of a backwards “C,” with the castle at the top and the town of Garolin at the bottom. There are little islets offshore but there’s no way to reach them. In between the castle and the town, monsters appear randomly: kobolds, goblins, orcs, thieves, hobgoblins, fighters, ogres, trolls, giants, gargolyes, and demons. The king gives you individual quests to kill the monsters in that exact order. After you complete each kill, you return to the king for an experience reward and the next quest. A large part of the game involves wandering around, waiting for whatever monster you need next to spawn. I just killed a goblin. An orc awaits to my east. As you finish each quest, you gain experience and level up from 1 to 6. Each level-up confers an additional 10 maximum hit points and an additional 5 to each attribute (except for the last one, which gives you 4 points so that the total doesn’t exceed 99). The king rewards me for the first quest. My character sheet about midway through the game. Combat is difficult because you have no tactics, just the (A)ttack command. At the outset, even that doesn’t work because you have no weapons and armor. 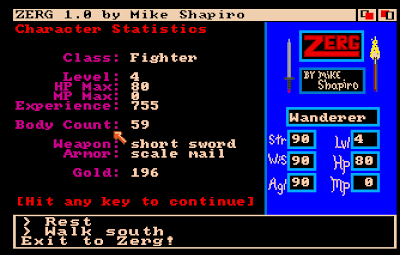 You must reach Garlion without getting killed by a monster so that you can purchase a dagger and heavy furs. 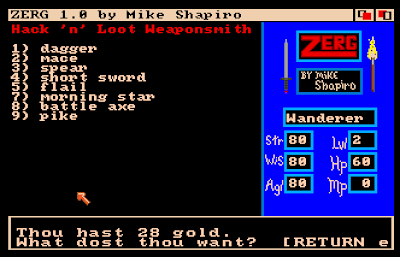 Over the course of the game, as you amass gold from your kills, you slowly upgrade weapons (e.g., mace, short sword, flail, battle axe) and armor (e.g., studded leather, scale mail, banded mail). The best weapon is a pike and the best armor is plate mail. Even with the best weapon and armor, combat is never truly easy, especially against some of the game’s higher foes. The only way to survive long-term is to adopt a strategy by which you stand near the castle or town and wait for enemies to spawn, attack them, and retreat indoors if your hit points fall too low. You then pass time while your hit points regenerate, go back outside, and resume the combat. This isn’t an exploit–it’s the only way to win the game. Even with it, the death screen is a constant companion, but reloading takes mere seconds. You see this screen a lot. I have a few compliments. The graphics are some of the best we’ve seen for Ultima clones (although the doors and objects in the castle and town have no substance; you just walk over them.) The game avoids the rubbish we see in most Ultima clones in which enemies can move on the diagonal but you can’t. This means you can generally outrun foes if you need to. I also have no complaints about the interface, which uses the keypad for movement and sensible letters for common actions, like (A)ttack, (L)ook, and (S)tatus. Perhaps the most baffling of these commands is the “Z” key, which gives you a longitude and latitude. Anyone who could get lost on this completely linear 40 x 40 island should probably be playing another game. Essentially the only use for the (L)ook command in the entire game. There are NPCs in the town and castle, but only a couple have anything interesting to say, and for some of them, their lines are cut off. (I fiddled with some video settings towards the end and I think I fixed that.) The only important clues are for the final quest. Once and only once do you have to use the (O)ffer gold command to an NPC. I have no idea what this NPC was going on about. The (T)alk and (O)ffer systems come together towards the end. You learn from one NPC that only magic can kill a dragon. Another says you need to offer gold to get the dragon spell, and a third tells you that you have to offer it specifically to the Duke of Cora. There may be more letters there but the name got cut off. Anyway, the duke gives you the spell for 400 gold. I should tell the king that you’re forcing me to bribe you to save the kingdom. After you kill a demon, the king’s last quest is to kill a dragon. The dragon doesn’t appear until you get the quest, but after you get it, he’s right outside the castle. You simply have to cast the spell (the extra “magic points” you receive are for nothing) and the dragon dies. This is more than I ever got from Lord British. The game earns an 18 on my GIMLET, doing best in the areas of “Economy” (3) and “Graphics, Sound, and Interface” (3, none of it for the sound, as there is none). It manages to just tick off 1 or 2 in everything else. 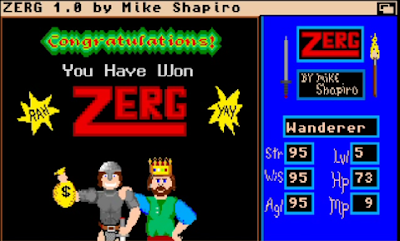 One hesitates to heap too much criticism on independently-developed freeware games, but I feel that Shapiro had a decent interface that suffered from a lack of content. A larger, more interesting game could have been built atop these mechanics. Then again, for a game I wanted to wrap up on New Year’s Eve, it’s length was perfect. I continue to get nowhere with The Seventh Link despite having put about 4 more hours into it. In a typical session, I start up, explore a bit, fight some creatures, but soon find that I haven’t made enough money to pay the food bill, and I thus have to quit without saving my limited progress. I haven’t leveled up or even figured out how to level up. I feel like I must be missing a dungeon somewhere–otherwise, the only thing to do next is somehow make enough gold for a ship, which seems impossible. If anyone has played the game and can offer me the necessary kick in the pants, I’d appreciate it. Equally frustrating is a five-hour session I spent with Theldrow. (Posting about Theldrow was supposed to be my alternative to posting about The Seventh Link, but I couldn’t make any progress in that game, either. This is why I was so grateful for Zerg.) Theldrow is insanely difficult in its opening stages, but that’s not my problem. My problem is that I can’t figure out anywhere to go. I’ve found the town of Boden, the nearby cemetery with its small crypt, and the secret forest passage that leads to the hermit’s hut and the “Bizarre.” That’s all I can find. Despite ramming into every wall and searching every square, I have no idea how to get to the castle or any other area of the game. I welcome explicit hints for this one as well; otherwise, I may kick it back to 1988, which I think is its original year, and declare 1989 finished. PREVIOUS POST Previous post: Trap Runner – Final version released of a rather charming Amiga game! NEXT POST Next post: Rygar AGA – Tecmo’s Arcade game as an Amiga port gets an update!